You and your kids are different. Whether it’s food, clothing, or so much more, your kids have different needs than you. The same can be said about dentistry. Kids need different treatments and services than parents do, so it’s no wonder they see a different dentist than you. But what if there was a practice that you could take your children to, where you could receive amazing dental work too? 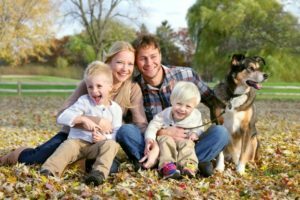 Keep reading to learn 5 benefits of choosing a family dentist in Westmont for you and your loved ones. A family dentist can treat everyone in your household, from toddlers to grandparents. Are you tired of keeping up with different appointments in different places? Most family dentist’s will try to schedule your whole family’s checkups and cleanings around the same time, so it’s as convenient as possible for everyone. Since a family practice can treat a wide age range, the dentist will also offer a variety of services to accommodate their diverse patient base. Maybe someone in your family needs to straighten their teeth, while another needs a tooth replaced? A family dentist can help both of these problems with braces and dentures at the same location! The longer you see your dentist, the better they will get to know you and your loved ones to provide more personalized care. Especially for kids, having the same dentist as they grow older will encourage them to attend regular checkups because they will be comfortable in the office. Plus, the better you know your dentist, the more comfortable you’ll be with any oral health questions you have in the future. Sometimes dental records get lost or forgotten when moving from practice to practice. If you have a dentist for the whole family, you’ll have access to everyone’s dental history at your fingertips. Your dentist will also better know your family’s previous history, so they will account for any treatments in the past when providing care. If you see a different dentist than your kids, they will never actually see you in the dentist’s chair. Children want to be like their parents, so if you can show them that you like going to the dentist, they’ll more likely want to continue regular visits as they grow older. The sooner you can instill the importance of routine visits, the better for your child’s future oral health success. Now that you know the advantages of seeing a family dentist, does it sound like you and your loved ones could benefit? Contact your family dentist in Westmont to get started on quality and convenient care for you and your children. Dr. Kathy Lam and Dr. Jason Hong are proud to run a practice for the whole family. They provide a wide-range of services for a variety of dental needs. For any questions, they can be contacted through their website or by phone at (630) 789-1555.